How can keywords help in your business? Find out your content marketing possibilities. 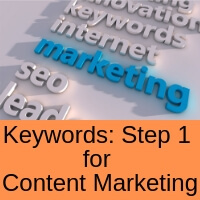 Step 1 - Why Keywords? Use the right keywords and more of the 3.5 billion Google Searches per day come to you. Trying to guess keywords will result in lower results in business marketing. Listen to your customer on how they describe your products and services. These are the keywords your customer will search for. These are seed keywords for more Internet Search traffic analysis. Adwords (https://adwords.google.com/) contains a free tool for Internet Search volume. Enter a seed keyword phrase(s), click Get Started, wait for results, click Download Keyword Ideas. Save the file. Look at the keyword spreadsheet. Which sub topics are in your product service niche? Look at the existing top 10 content examples for each sub topic. Can you do better? Look at the questions being asked by Internet Search users? Which ones can you answer? Search Volume relates to monthly searches on that sub topic. Balance your writing efforts with likely returns. Make a short list of sub topics and questions. Consider the content depth and breadth around your niche. The more the better. Customers can search multiple times to reach the final purchase decision. Awareness - High level topic information on customer jobs, pains and gains. Interest - Topic category guides, eBooks, Whitepapers. Consideration - Case studies, data sheets, frequently asked questions. Evaluation - Free trials, demonstrations, quotes, coupons. Purchase - Onboarding, support, instructions. Retention - Complimentary products, premium products, subscriptions. Different keywords are needed along the customer funnel to purchase. E.g. Information, compare, buy. Website content for organic search traffic. Keywords go in title, heading and content. Social Media post for brand, product and service awareness. Also backlinks to website. Pay per click ads. Google and Facebook. Links to website landing page. Opt-in to collect emails. Sales letters and emails. Address customer fears and aspirations. Show their customer value. Press Release. Media coverage awareness. More backlinks to your business.